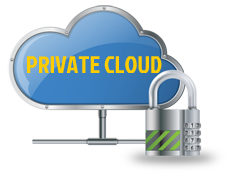 For this section we are going to let you see precisely what a Private Cloud is and the three models you can utilize. Measured service – the capacity of the cloud services are optimized for customer usage and its usage is reported on a regular basis. Based on this criteria NIST also defines three service models of cloud computing. All software is running in YellowHammerIT's DataCenter where we fully manage all aspects of your environment. This is one of our finest offerings giving our clients full and total control over all their data without any of the management responsibilities. A server is running in the YellowHammerIT's DataCenter and is fully managed. Our client however is managing the applications running on the server and is fully responsible for all the data stored on the server. A server is running in the YellowHammerIT's DataCenter but is fully managed by the client. Everything running on this server is the client’s responsibility: This includes the operating system, the applications running on this operating system and the data stored on the server. YellowHammerIT evaluations are always free, contact us today for yours!